Infection diagnosis and antibiotic susceptibility testing (AST) are time-consuming and often laborious clinical practices. This paper presents a microwave-microfluidic biosensor for rapid, contactless and non-invasive device for testing the concentration and growth of Escherichia Coli (E. Coli) in medium solutions of different pH to increase the efficacy of clinical microbiology practices. The thin layer interface between the microfluidic channel and the microwave resonator significantly enhanced the detection sensitivity. 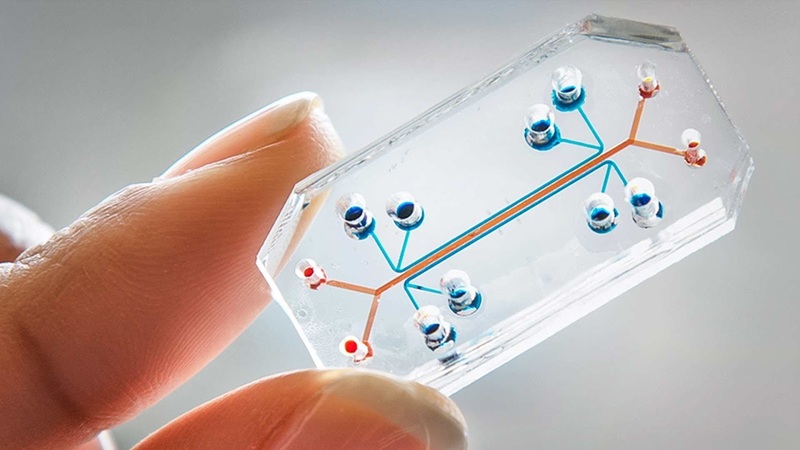 The microfluidic chip, fabricated using standard soft lithography, was injected with bacterial samples and incorporated with a microwave microstrip ring resonator sensor with an operation frequency of 2.5 GHz and initial quality factor of 83 for detecting the concentration and growth of bacteria. The resonator had a coupling gap area on of 1.5 × 1.5 mm2 as of its sensitive region. The presence of different concentrations of bacteria in different pH solutions were detected via screening the changes in resonant amplitude and frequency responses of the microwave system. The sensor device demonstrated near immediate response to changes in the concentration of bacteria and maximum sensitivity of 3.4 MHz compared to a logarithm value of bacteria concentration. The minimum prepared optical transparency of bacteria was tested at an OD600 value of 0.003. The sensor’s resonant frequency and amplitude parameters were utilized to monitor bacteria growth during a 500-minute time frame, which demonstrated a stable response with respect to detecting the bacterial proliferation. A highly linear response was demonstrated for detecting bacteria concentration at various pH values. The growth of bacteria analyzed over the resonator showed an exponential growth curve with respect to time and concurred with the lag-log-stationary-death model of cell growth. This biosensor is one step forward to automate the complex AST workflow of clinical microbiology laboratories for rapid and automated detection of bacteria as well as screening the bacteria proliferation in response to antibiotics.